When you’re looking for shirts & blouses suitable for work, Stitch & Print have a wide range that will meet your staff needs. The great thing about these shirts is that they are all customisable, through our expert embroidery and print services. Our workwear shirts & work blouses UK range is specially selected to include the best brands in the workplace, such as Kustom Kit, Henbury, Russell Collection, and Premier. Our first priority is making sure you will be happy with your custom shirt and its branding. The full range can be seen on our main website. The shirt, as a distinct garment, can be dated back to 3000 B.C. The oldest preserved garment was a linen shirt found in a First Dynasty Egyptian tomb. It was described as being sophisticated, with the shoulders and sleeves finely pleated to give form-fitting treatments while allowing the wearer room to move. These features are still used today to make shirts that are excellent work garments. The shirt in the Middle Ages was a plain, undyed garment worn next to the skin and under regular garments, in fact it was generally regarded as underwear until the twentieth century. The shirt became a popular work garment in the twentieth century and began to take the shape of the shirts we know today. It evolved from being seen as a lower-class undergarment to a smart and professional piece of clothing. For me, It’s got to be an Oxford style workwear shirt or work blouse for business wear. Tailored styling in a heavier fabric keeps you looking at your best all day long. These shirts & blouses available in both short sleeved & long sleeved options as you’d expect, although you might be surprised at the enormous range of colours available. It’s not just white or corporate blue: the Kustom Kit range of work shirts comes in 13 different colours! So – whatever your company or club colours we’ll have something to suit. There are plenty of extras too; Easy Care & wrinkle resistant options are increasing in quantity so life is becoming a lot easier in the laundry room! We understand that it is very important for your workforce to look and feel great, whatever line of work they are involved in. We have a wide range of shirts & blouses suitable for every working environment in Cumbria and the wider North West. Whether it’s an embroidered blouse as part of your staff uniform in retail; personalised shirts for your UK hospitality staff or heavier duty working shirts for warehouse staff; we have it covered. The Premier Short Sleeve Pilot Shirt has two breast pockets with buttons, epaulette bars and a stiffened collar. It would be perfect for security employees and is available in ladies sizes and fittings as well. The epaulettes can even be bought separately, and stitched with your required design. Sports & Club Wear: Fun Shirts With Seriously Smart Style! K186 Formula Racing shirt. Brilliant workwear shirt for the teams supporting the race team! Gamegear are specialists in the field of making high quality shirts & blouses for sporting teams and events. At Stitch & Print, we stock a range of their shirts: ideal for sporting purposes and the big events. The Gamegear Formula Racing Short Sleeve Sebring Shirt is designed for racing teams and is made from mercerised cotton and polyester giving it a unique finish. This garment has a button down collar and contrasting back yoke, shoulder and sleeve panels, with contrast piping. It is available in several colour combinations giving great options in the team wear market. One of our most popular styles of shirts & blouses for the UK’s team & club wear market is the Henbury Oxford shirt. It comes in a super heavyweight fabric (170 gsm versus standard Oxford at 130gsm) giving a traditional cotton chambrey feel. It’s available in long & short sleeved options for both men and women. We also provide more fashionable leisure style shirts, including denim and safari varieties, all suitable for embroidery of your club logo and branding to give you that set of high class customised shirts that will set your team apart! 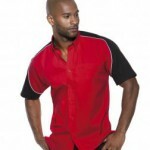 Kustom Kit produce a range of shirts & blouses designed specifically for the hospitality industry. Be they bar staff or waiting staff you need to provide for; this range of uniform shirts has been designed to be both practical for the industry as well as smart & stylish to make the right impression with your customers. The Bargear range has a complimentary range of workwear aprons giving you the opportunity for highlighting your brand through your staff uniform. An embroidered apron can really set off the uniform you ask your staff to wear and help them maintain the image and atmosphere you try to create for your customers. Stitch & Print can help when it comes to kitting you out with the shirts & Blouses for your staff. The variety in our brochure is second to none, and every shirt or blouse in there can be customised by our expert embroidery and printing team. This entry was posted in Shirts & Blouses, Workwear and tagged blouses, business, Cumbria, embroidered, hospitality, North West, shirts, uniform, workwear on 23rd November 2014 by admin.